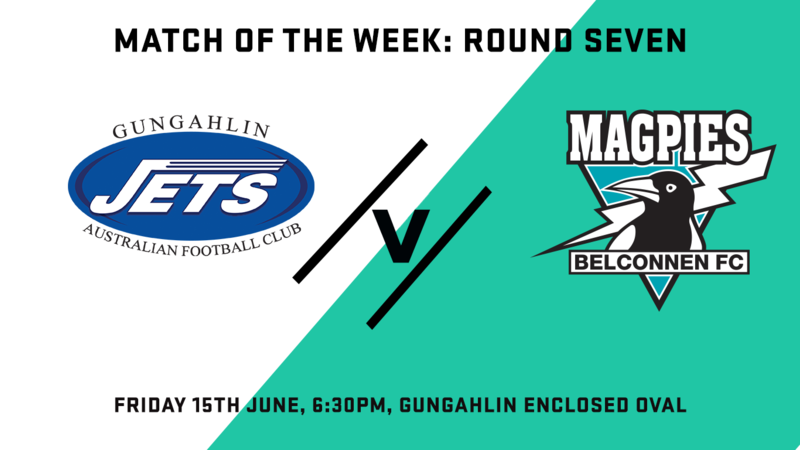 Belconnen travelled to Gungahlin Enclosed Oval to take on the Jets on a cold and wet Friday night fixture. The ever-improving Jets were looking to test themselves against one of the premiership contenders, as the Pies were aiming to bounce back after a Round 6 loss to Ainslie. The first quarter got underway and it was Belconnen who hit the scoreboard first with Chris York kicking the first goal of the evening. That would start a run of 5 straight goals for the magpies, with Matt Viney and Brad Hoffmann kicking 1 goal apiece and debutant Charlie Baker adding 2. Gungahlin showed glimpses in the first quarter, but they were unable to capitalise on any forward surges to trail the Pies by 32 points at the end of the first quarter. The Pies started off the quarter in scintillating fashion with Hoffmann kicking his second goal 30 seconds into the quarter to make it 6 in a row. The Jets then kicked their first goal of the game with Luke Martin kicking his first. The slippery conditions were playing havoc with a number of stoppages throughout the middle portion of the quarter, but the Magpies acclimatised quicker, kicking another 4 goals before half time to have a 51-point lead at halftime. Jets 1.3-9 to Pies 10.2-62. The third quarter started, and the conditions were getting the best of both teams with a scrappy start to the quarter. The Jets were looking promising and had a number of opportunities to trim the lead, but skill errors hurt them heading into attack. The Magpies hit the scoreboard first with Beau Walker kicking his first goal of the match, which would be the only goal scored for the quarter. The final quarter kicked off much like the third with some scrappy football and numerous stoppages, before it was again Beau Walker who kicked the first of the quarter to extend the lead to 66 points. That was before Gungahlin fought back, with Daniel Leon and Jayden Hind kicked goals in quick succession to narrow the lead. Belconnen then steadied the ship through Sam Fisher who kicked his first goal of the game, only for the Jets’ Jacob Mennen to kick his first just before the final siren, with the Magpies crowned victors by 53 points. Alex Jones was instrumental in the ruck for Belconnen, giving his midfielders first use as well as gathering the ball at ground level himself. Jayden Hind was best on ground for Gungahlin getting plenty of the ball playing through the forward line and on the wing, setting up a number of inside 50’s for the Jets.